PLEASE NOTE: Saturday night's concert at Schroeder Hall is SOLD OUT. There may be a very small number of tickets available for purchase at the box office at 7:30pm, but we strongly encourage those who have not yet purchased tickets to come to our Friday night concert at St. Andrew Presbyterian in Sonoma. For the concert at Schroeder Hall, if you would like to purchase tickets at the door or are having your tickets held at will call, please come to the Schroeder Hall lobby. Do note that there is a real possibility that we may sell out. To get your free ticket, you must come to the ticket table at the concert and present your current Sonoma State University student ID. These tickets are available only between 7pm and 7:30pm. These tickets are distributed on a first-come, first-served basis and will be up for sale to the general public starting at 7:30pm. One ticket per valid ID. 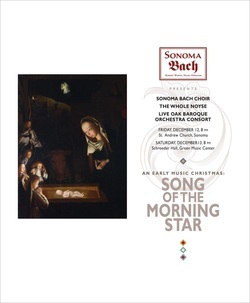 Led by Robert Worth, the Sonoma Bach Choir and the continuo section of our period-instrument ensemble Live Oak Baroque Orchestra join forces with the early brass quintet The Whole Noyse to present Christmas music themed around "Wie schön leuchtet der Morgenstern," including music by Praetorius, Scheidt, and Schütz.